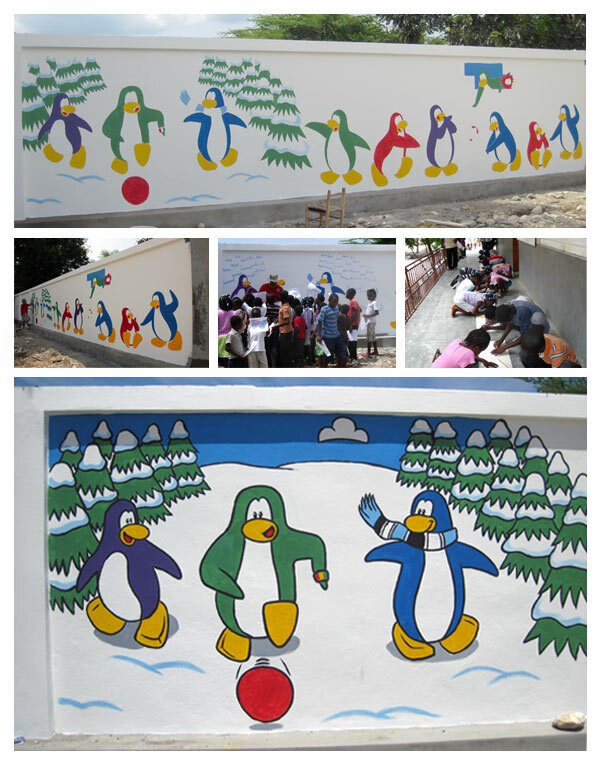 Club Penguin Cheats by Mimo777 Club Penguin Cheats by Mimo777: The Club Penguin mural in Haiti is complete! Pretty Cool! Nice work Club Penguin! Let's hope someone does NOT mess it all up with graffiti or something! Hey! I want to know what town and school in Haiti this is at! Someone email Club Penguin and let me know, k?! Also Rockhopper at server SnowBoard Right now at cove but hes leaving soon! I wish those kids at their new school will have a good time there. Oh, and when you wear the green hoodie and dance, you penguin has an old blue color on. u want somebody to put graffiti on it? How come none of the penguins in the mural hav eyes? I think that was a typo on Mimos part and I don't know why they don't have eyes. Maybe we just can't see them in the picture or they didn't finish it yet or maybe they weren't supposed to have eyes. Yea it would be stink if someone ruined it! I met rockhopper 37 times! I allways seem to be on the same server! I bet everyone is really happy in Haiti! Hmm... I don't think I could catch him, do you? LOL! Oh wait, it doesn't matter. He lives in my basement! I hope so too! And yeah, I already told Mimo that glitch. :) The glitch it almost as cool as CPG! :O That's AWESOME! I once met Rockhopper! See, my friend and I stayed up all night searching for him, then we gave up, logged onto our favorite server, and went to play the treasure game! Then as soon as I was about to go through the door, I see a red penguin come, and I'm like, "Whoa whoa whoa.. wait a second..." ANd I go back, and he's THERE! :D Then we had a toot parade and told us a REALLY funny story. LOL, I'm pretty sure he doesn't! THey do have eyes if you look at the bottom pic. I'm pretty sure you just can't see them from farther away because they are tiny! Congratulations! Lol, but like you said, please no caps! Or maybe you will break Rockhopper's ears... o_O And not too many "!!! ", okay? Yeah, it's so kind of them! The kids in Haiti really deserve it! The penguins do have eyes, but I just don't think you can see them from farther away, like in the top pic! But in the bottom one, they are there! Yup! They rock like the Migrator in stormy seas! Horrible idn't the word, Bobhead202. Is the party going to be over today, do you think? Cos I haven't met Rockhopper is a long long time! The funniest thing happened today. I lost my membership and went to check my hand items and I could wear the cotton candy and paddle ball, but I just got these as a member a few days ago. This rocks! Yeah! It's so amazing! If someone ruined it, I would be VERY mad! Lol! He seems to have a few favorite servers, so maybe that's why! Hmm... in the top pictures, it looks like that... but then again, in the bottom picture, it has black... Maybe you can either not see it, or they weren't completely finished when they took the pictures at the top! sorry I haven't posted much lately. too much homework!! I think that either those are two different murals, or the first mural was an unfinished version, because the second has outlines and a blue sky, which the first clearly doesn't have. Hi Mimo I asked them and they said the school and playground are located in Hinche also known as Central Plateu In Haiti. It serves kids the where displaced by the earthquake. Hope that answers your question!